Utah winters can be fierce, but there’s something even fiercer: a Utahn’s love of hot chocolate! It could explain why the Beehive State is home to nine artisan chocolate makers, a chocolate society, numerous chocolate festivals, Matt Caputo’s artisan chocolate distribution company and craft chocolate classes, and any number of coffee shops and eateries that will happily whip up a cup of hot chocolate to pair with your finest meal. 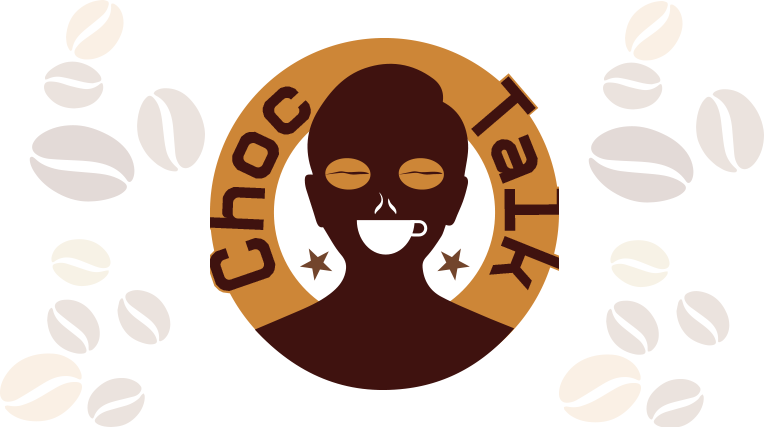 Why do we love this cacao-bean concoction so? Well, perhaps, as a Cornell University study pointed out, the antioxidant concentration in hot chocolate is almost twice that of red wine, three times more than that of green tea and almost five times as much as black tea. Hot chocolate may actually help you think more clearly thanks to flavonoids that scientists say increase blood flow (and oxygen) to the brain. So, if Utah chocoholics needed a rationale to drink the creamy brew, they now have one. This holiday season, indulge in one of these decadent mugs with a friend. 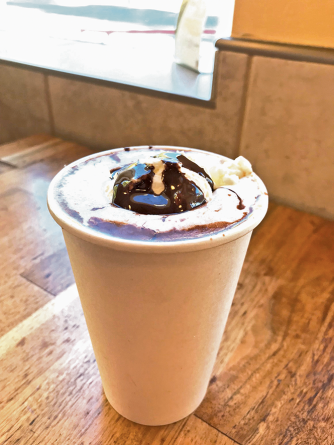 This made-from-scratch hot chocolate ($3.75) contains only three ingredients—milk, chocolate and sugar—and comes in a no-nonsense paper cup. Ricci Anderson, manager at the Bruges Waffles & Frites Sugar House location for five years, says they create hot chocolate the way it’s been done in Belgium for hundreds of years—by dissolving chunks of Belgian chocolate and sugar into milk and adding their own crème fraîche on top. 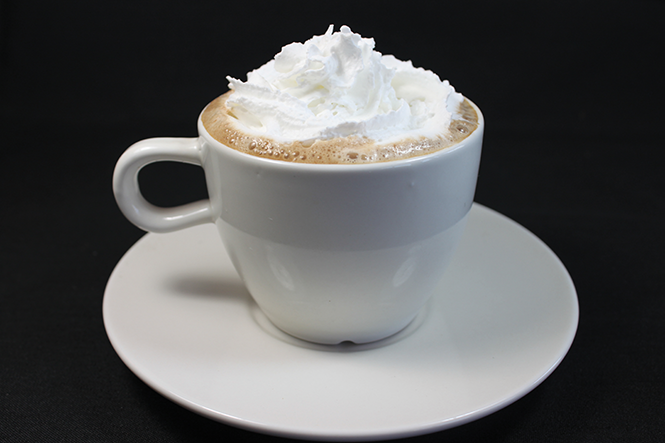 Available now through early February, this hot chocolate is a winter treat not to miss. “Made with love and crème fraîche!” Anderson says. 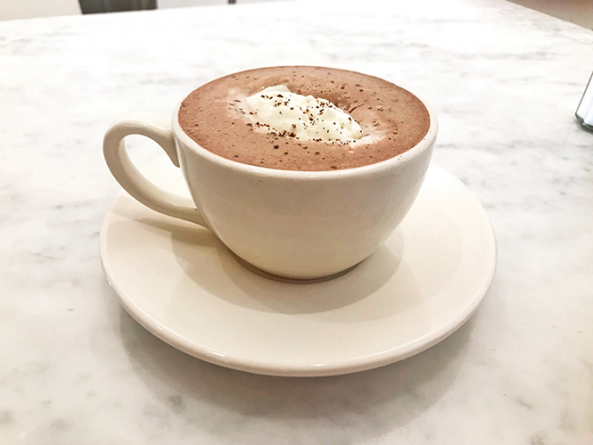 Maria and Jimmy Kosmas, the mother and son co-owners of Greenhouse Effect Coffee, are famous first for their coffee and crêpes, but their made-from-scratch hot chocolate ($2.75) is right up there as well. Maria and Jimmy pride themselves on their European style-beverage that uses ingredients from Caputo’s market. “Even if you didn’t add sugar, the chocolate is so flavorful and satisfying,” Maria says. 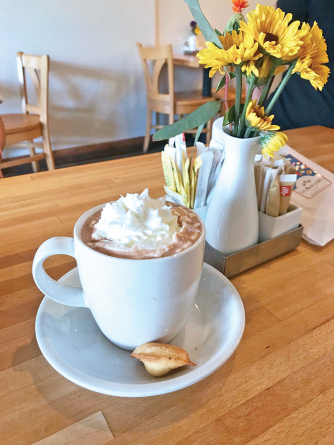 The coffee shop features hand-drawn menus by local artist Makenzie Taylor and, in winter months, they feature what Maria calls a “European Chocolate Drink,” which is pure, melted chocolate served in an espresso cup.